Today's card by customers/readers is from La Papera Gialla! La Papera Gialla : Today I'm for Pink! The image she used is HERE. Have a crafty weekend everyoen~!! Oh, what a sweet couple! Love the little rose! 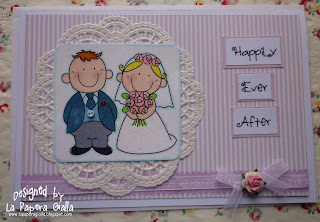 Such a cute card, love the doily!